The competition is open to any individual. Up to four photos (about 1MB each in size) relating to honeybees or beekeeping may be submitted. Please include your name, postcode (or equivalent) and country in your email. You may also include captions for your photographs if you wish. The deadline for entries to the competition is 22 October 2017. Entrants must certify that the image/s they are submitting is their own work and that they own the copyright. It is the responsibility of each entrant to ensure that any images they submit have been taken with the permission of the subject and do not infringe the copyright of any third party or any laws. In providing images for the competition, each entrant agrees that Vita can put it in the online Vita Gallery for others to use and in the Vita Calendar and to use it for marketing purposes. Wherever used, Vita will credit the contributor. Vita will enter your email address on its mailing list unless you specify otherwise. You can ask for your email address to be withdrawn from the mailing list at any time. 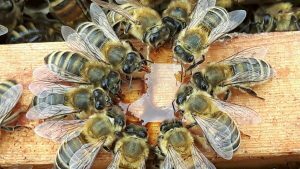 Vita (Europe) Limited is a mite control and honeybee health specialist. It is the world’s largest dedicated supplier of honeybee health products to the honey and pollination industries. With a rigorous and ethical approach to research and development into honeybee health, Vita has no commercial interests in crop pesticides or crop breeding that may be harmful to honeybees. Follow Vita as “Vita (Europe) Ltd” on Facebook and Google+ and as @vitaeuropeltd on Twitter.